The Xavante became well known in Brazil at the end of the 1940s thanks to the government's campaign to publicise its 'March to the West'. The Indian Protection Service (SPI) were praised for their work in "pacifying the Xavante". Yet the local group which was 'pacified' by the SPI in 1946 was only one among the various Xavante groups which lived in the east of Mato Grosso, a region which the Brazilian government was then seeking to open up to colonization and the expansion of capitalism. In the Xavante version of events, it should be noted, it was the "whites" who were"pacified". 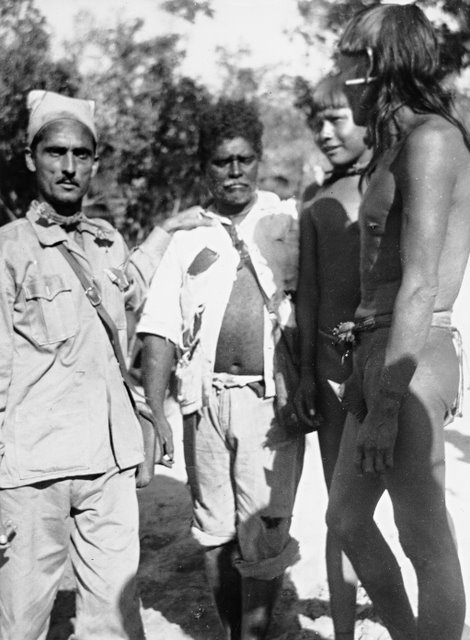 From mid-1940 to mid-1960, specific Xavante groups established different peaceful relations with different sectors of the surrounding society - including SPI teams, Catholic and protestant missionaries. The agents of contact and the manner in which contact happened influenced Xavante groups in different way. Beliefs and religious practices, as well as some social institutions and ceremonial practices were affected, especially among those whose contact was with missionaries, whether Catholic or Protestant. Inspite of these impacts, Xavante culture continued to be extremely vibrant, and was retransmitted from generation to generation through the language and through innumerable social, cosmological and ceremonial mechanisms. Besides some differences noted by ethnographers among the different Xavante groups because of their different experiences during contact, the common language, the pattern of social organisation and institutions, the ceremonial practices and the cosmology define the Xavante as one social entity. Yet their communities remain politically autonomous, although sometimes they unite to achieve common aims. The Xavante- who call themselves the A´uwe (people ) - together with the Xerente, who call themselves the Akwe, and live in the state of Tocantins, make up an ethno- linguistic group known in anthropological literature as Acuen,belonging to the Jê lingustic family. of the Macro- Jê trunk. In colonial and imperial days, the Acuen groups were also identifed by the ethnic group names “Xacriabá” e “Acroá”. These designations were produced by non-indians in order to identify and differentiate between the various Acuen sub-groups which controlled a vast territory in Brazil's midwest. In the literature of travellers, explorers and missionaries, the Acuen, like other groups in what was called Central Brazil, became known as Tapuias, to distinguish them from the groups of the Tupi trunk, denominated Tamoios who lived on the Brazilian coast. The Xavante should not be confused with the Oti-Xavante of the west of Sao Paulo state and the Ofaié (Opaié) who are Xavante from the extreme south of Mato Grosso, with whom they share no historical or sociological characteristics. According to the most generally accepted version, the name "Xavante" was given to them by non-indians to differentiate them from the other Acuen, especially in relation to the Xerente, from whom they separated in the then province of Goias in about 1820. For some years, groups who had been identified by non-indians as "Xavante" made successive crossings of the Araguaia, Cristalino and das Mortes rivers and took permanent refuge in the east of Mato Grosso where they are today. The contemporary A’uwe incorporated the designation "Xavante" and use it refer to themselves when they are dealing with whites. Among themselves, though, the different sub-groups identify themselves as a’uwe or a’uwe uptabi (the real people). The mother tongue has been maintained and retransmitted to the new generations - nowadays also in new spaces like the school - and is extremely alive. When speaking to non -indians many Xavante men speak and understand Portuguese well, although this is not true of most of the children, women, or old people. Today there are some 13,000 Xavante living in the nine indigenous areas which are part of the territory they traditionally occupied for at least 180 years, in the region which comprises The Roncador mountain range and the valleys of the das Mortes, Kuluene, Couto de Magalhães, Batovi and Garças rivers, in the eastern Mato Grosso. Apart from the Chao Preto and Ubawawe indigenous areas which border the Parabubure indigenous area, the other six Xavante areas -Marechal Rondom, Maraiwatsede, São Marcos, Pimentel Barbosa, Areões and Sangradouro/Volta Grande are geographically unconnected. Located in the midst of a set of river basins with a rich regional biodiversity, making them the basis of the traditional indigenous way of life, this region has suffered the environmental impact of extensive cattle ranching ever since the 1960s, an impact which is almost certainly irreversible. From the 1980s the impact has been intensified by the spread of giant grain, especially soy, farms, producing for export. Like any other indigenous peoples, the Xavante suffered a big drop in population during the different phases of contact with "civilization". From the 1970s, with the beginning of the demarcation of their lands, the population began to grow again at a constant rate of almost 5% a year. Some population estimates indicate that at the time of the first contacts of the Acuen (“xavante”, “xarente”, xacriabá”, “acroá”) with Brazilian society (around 1750). ?? In mid-19th century between three and five thousand indians of this ethnolinguistic group, who were then living in villages in the Pedro III settlement in the former province of Goias (now the Carretão indigenous area in the state of Goiás). Brother Rafael de Taggia wrote that in 1852 about 4000 Xavante and Xerente indians were living in the Teresa Cristina settlement, today the municípality of Tocantinia in Tocantins, besides the Tocantins river. But such estimates cannot be taken literally, because the superpositioning of identities and territories of the mentioned sub-groups considered as Acuen, makes it difficult to calcule the precise numbers of these populations. Only in the 1940s and 50s, after the (re) contact of the local Xavante groups who were now living in the eastern Mato Grosso, with agents like the Salesian catholic missions, the SPI and the ethnologist Maybury-Lewis, was it possible to have more exact data on the Xavante demographic dynamic. At the beginnng of the 18th century, the discovery of gold in the then province of Goiás led to the arrival of miners, explorers, settlers and misionaries, causing conflicts with the local indigeous populations. The indians reacted in different ways to the outsiders' invasions. Some resisted, with surprise attacks and warfare, others stayed put or migrated. In the second half of the century several groups, including some identifed as "Xavante", were living in settlements sponsored by the government, where they suffered the devastating effects of epidemics of disease. Later, sometime at the end of the 18th or the beginning of 19th century, the forebears of the Xavante crossed the river Araguaia. This displacement towards the west definitively separated the Xavantes from the Xerentes, who remained on the east bank of the river. The old Xavante told dramatic stories about the separation of their people from the Xerente. In one of these versions, a huge dolphin reared up in the middle of the Araguaia, blocking the river and terrifying the "relatives" who had not yet crossed over. Another version talked of a large number of dolphins who carried the Xavante across the turbulent waters of the Araguaia. In both stories those who remained behind on the east bank of the river were abandoned for ever. They were, according to the old people, the ancestors of the people who are today known as the Xerente. Once they had crossed the Araguaia, the Xavante established themselves in the region of the Roncador mountains, in what is today the state of Mato Grosso. Their original community,Tsõrepre, went through various cisions over the years. During the 19th century and the first half of the 20th, different groups migrated further west, either following the banks of the Rio das Mortes, or heading towards the Suiá-Missu river and the headwaters of the Kuluene river. Up until the 1930s, all of them were relatively free of problems caused by white society. When the government of Getulio Vargas began the famous 'March to the West', once again they began to come under pressure from the advancing groups and their conditions worsened. Together with the state campaign in favour of opening up the interior of the country to colonization, Brazilian newspapers and magazines published government propaganda articles that portrayed the Xavante as a symbol of the "noble savage". They became the first indians to be made famous by the mass media. The articles showed the Xavante as a brave and heroic primitive people, who after being "pacified" and joining the 'march of progress' which accompanied the move to open up the west, had been empowered by the embrace of Brazilian society. State rhetoric equated the "taming" of the region's indians, personified by the Xavante, with the taming of Brazil's wild interior. After all, according to the state narrative, the heroic primitive qualities of the Xavante contributed to national character, and they would be incorporated into the productive social and economic structure of the country. To document the heroic activities of the domesticating mission for publicity purposes, photographers and journalists were chosen to join the SPI team which was charged with "pacifying" the hostile Xavante. Two Salesian priests who had tried to make contact with the Xavante in 1932, and a SPI "pacification team" led by Pimental Barbosa in 1941, had been killed by local Xavante groups angry at the invasion of their territory. These facts led the media to stress the impressive bravery of the Xavante and their ferocious resistance to outsiders. In 1946, when a SPI team led by Francisco Meirelles finally achieved their aim and exchanged goods with members of the Xavante group led by Apoena, there were intense celebrations in some of the media and in the government. The publicity around the "pacification of the Xavante" practically made Meirelles and Apoena into national heroes. The media coverage, with positive images of the Xavantes and their noble qualities, remained in the national memory for decades after this first peaceful contact. However it was only in the mid 1960s that the "contact" with the Xavante was completed. By then, all the Xavante groups had established or admitted peaceful relations with representatives of Brazilian society, in different ways and at different times. Some groups, exhausted by disease, hunger and conflicts with settlers, had sought out SPI posts; others had sought refuge at Salesian or Protestant missions. As the Xavante groups gave way to the pressures of advancing white society, the territory which had been theirs for over 100 years and had guaranteed the continuity of their traditional way of life, was now accessible to to colonization and especially to capitalist production. In the 1960s and 1970s, encouraged by tax incentives, designed to stimulate colonization and large scale economic development, settlers and farmers arrived in the region. Their access to portions of the traditional lands of the Xavante often involved fraud. Cases are known of authorities altering maps and certifying to the absence of indians, in order to offer land to agribusiness. Farmers planted immense areas of monoculture, first of all rice on the higher grounds, and more recently, soy. They also cleared huge areas of the cerrado land for cattle raising. The end of the 1970s and beginning of the 80s was marked by intense struggles to recover the ancestral lands as well as efforts to demarcate the land which they still occupied, and in some cases, to enlarge its limits. From the mid-1970s, many of the families who had left the lands they inhabited in pre-contact times to seek refuge in missions or SPI posts began to return to their original territories. On doing so, they found them occupied by settlers or farmers engaged in large scale agribusiness. In some places the non-indian colonizers had established entire towns. When Xavante leaders began to demand the return of their land, the reply in many places was violence, both real and threatened. The Xavante faced powerful enemies when they began to put pressure on the government to demarcate their land, especially the large farmers who had political power and huge properties. One of them was the Suiá-Missu Ranching Company,which had driven the Xavante out of an area they called Marãiwatsede. In the 1970s the company was one of the biggest landowners in Brazil, with over 1,5 million hectares. Another giant company, installed in the area between the Kuluene and Couto Magalhães rivers, was the Xavantina Farm. Its infrastructure included 300 kms of internal roads and 400 kms of fencing. During the height of the busy season it employed 200 workers who lived there with their families. There were 10,000 head of cattle and each harvest produced an average of 16,000 sacks of rice. The Xavante are politically astute and persistent in the fight for their rights. 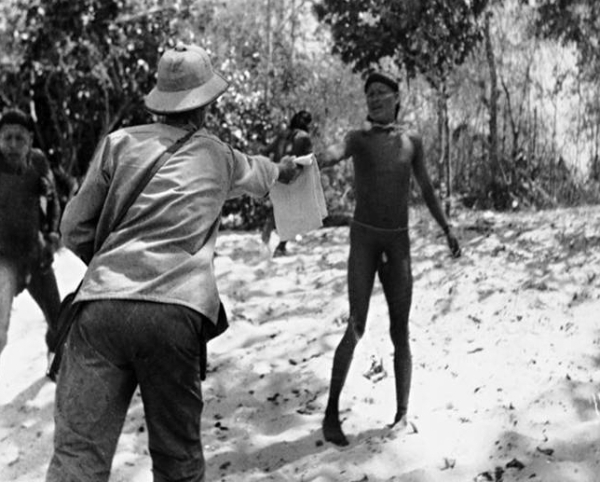 At the end of the 1970s and beginning of the 1980s, they developed efficient tactics for putting pressure on the state to recover their lands and obtain assistance in other questions. They won the recognition of their rights over relatively extensive areas of land. At the end of 1981, six Xavante areas had been demarcated: Areões, Pimentel Barbosa, São Marcos, Sangradouro, Marechal Rondon and Parabubure. Inspite of these victories, conflicts have continued in some places up until today. In the 1990s, the Xavante won the right to extend the limits of several areas, and, after a long battle, they managed to get the demarcation and official recognition of the Marawãitsede area in the Suiá-Missu region. Yet inspite of the completion of the process for official recognition, a large part of the indigenous area is still occupied by hundreds of non-indians. Just one small group of Xavante have managed to occupy a small part of the Marawãitsede area. The Xavante inhabit a central zone of the Brazilian cerrado in a complex ecozone which combine the vegetation of the cerrado and the woods. (mata de galeria? It is a zone with two well defined seasons: the dry season between April and October known as the 'winter' and the rainy season, or 'summer' in the other months. Agriculture, above all maize (used by the Xavante in socio-cosmological ceremonies) beans and squash, has only a secondary role in the economy. The crops harvested from each plot belong to each household, and while the men carry out the tasks of clearing and burning, the women do the planting. The traditional basic diet consists of products collected mostly by the women: wild roots, nuts, fruit and other vegetables. Collecting is supplemented by the men's contribution from hunting and fishing. Game and fish provide proteins and can be preserved by smoking. Up until the intensification of colonization in the 1960s, the Xavante obtained these foods on hunting and collecting excursions: long trips, sometimes lasting months, made by groups of extended families. In the dry season, the groups of travellers met in large semi-permanent villages to hold their ceremonial activities. This pattern of occupation, involving prolonged excursions, meant that the territory needed by the Xavantes for their subsistence stretched over an area which they could explore during the entire year. On these expeditions, the territory of each group was explored separately by the social segments made up of the households which were most closely linked by kinship. They communicated by means of smoke signals, so they could all meet together at the end of the expedition. Each day they camped to rest. The camps were a miniature version of the base village, the houses being disposed like a horseshoe, and in the distribution of the domestic groups inside. Today these traditional excursions have all but disappeared, because of the shrinking of the amount of land available to the Xavante and the scarcity of game in it. Nevertheless, short hunting and fishing trips, lasting a day or two, when the hunters ignore the fences of the ranches, are common. Game has a prominent place in the diet and in social life. For the men, hunting is not only an important economic duty but a mark of male capacity, as it demands qualities of physical resistance, speed, agility, vigilance and agressivity. It is a central component of some ceremonies, like the Wai’a, and marriage celebrations, when the men go out on long hunts. The environmental degradation caused by cattle raising and agricultural monoculture inside and around Xavante lands, has led toa sharp drop in the game available. Meat and fish, the main sources of protein, are scarce in most of the present Xavante areas, while in the smallest areas, the lack of game is severe. In addition, as the present lands of the Xavante are no more than small fragments of the area they once had for their subsistence, to find enough game, especially for ceremonies like weddings, which need large quantities of meat, frequently obliges groups of indian hunters to enter the private ranches, either to hunt or demand that the ranchers give them cattle. This situation often results in serious conflicts. Despite the Xavante efforts to maintain their traditional way of life, the intrusion of activities aimed at the market obviously causes significant upsets to it and to their traditional economy. To accelerate their assimilation into the regional economy and society, government policies introduced first by the SPI and later by FUNAI, encouraged them to adopt different practices like cattle raising and slash and burn agriculture. As the lands they had been left with could no longer support their traditional way of life the Xavante became increasingly dependent on the crops they grew in this way, and on FUNAI to give them goods bought in nearby towns. The need for money used to lead some of the men to work as paid labour on the ranches, but today many Xavante are employed by FUNAI, either in their own areas, as heads of posts, or in the regional HQ or even in FUNAI's central office in Brasilia. The general income of Xavante communities nowadays includes state pensions, the salaries of teachers and health monitors, and funding from government agencies for indigenous associations. This page was last edited on 26 March 2018, at 17:26.